Goldstone, who chaired the UN Human Rights Council’s commission charged with accusing Israel of committing war crimes in Gaza during Operation Cast Lead, has become a darling of the anti-Israel Left in the weeks since his report accusing Israel of committing both war crimes and crimes against humanity was published last month. And anti-Israeli leftists don’t like the idea of someone challenging his libelous attacks against Israel in a public debate at a university. It seems rather unfair to pick on a small fry like Sussman. A brief Web search indicates that Gold’s would-be silencer divides his time fairly equally between publishing rambling, Communist verses to paramours and calling for the overthrow of the US government. This, by the way is true regardless of where the speaker fits on the pro-Israel spectrum. Earlier this month former prime minister Ehud Olmert – who during his tenure in office offered the Palestinians more than any of his predecessors – could barely get a word in edgewise above the clamor of students at the University of Chicago cursing him as a war criminal. While many commentators claim that the situation on college campuses is unique, the fact is that the attempts of leftist activists on campuses to silence non-leftist dissenters regarding Israel and a host of other issues is simply an extreme version of what is increasingly becoming standard operating procedure for leftist activists throughout the US. Rather than participating in a battle of ideas with their ideological opponents on the Right, increasingly, leftist activists, groups and policy-makers seek to silence their opponents through slander, intimidation and misrepresentation of their own agenda. CASE IN point is J Street. The 18-month old, multi-million dollar American Jewish political action committee held its inaugural convention this week in Washington. J Street seeks to present itself as the representative of a silent majority of American Jews. However, its signature positions – while in line with the Obama administration’s policies – are deeply discordant with mainstream American Jewish views. J Street asserts that Israel must freeze all Jewish construction beyond the 1949 armistice lines; that Israel should withdraw to the 1949 armistice lines, including in Jerusalem and expel all Jews now living beyond the 1949 armistice lines; that the absence of peace is due to the absence of a Palestinian state; that Israel used excessive force in Operation Cast Lead and the Goldstone Report is legitimate. J Street also opposes both sanctions on Iran and military strikes against Iran’s nuclear facilities. Just how profoundly out of synch these positions are with the American Jewish community was made clear with last month’s publication of the American Jewish Committee’s 2009 Annual Survey of American Jewish Opinion. According to the survey, a majority of US Jews oppose the Obama administration’s call for the prohibition of Jewish construction in Judea, Samaria and Jerusalem. 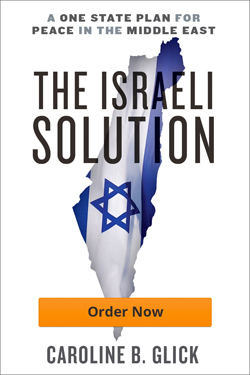 Similarly, the vast majority of US Jews rejects the call for Israel to surrender parts of Jerusalem to the Palestinians; believes the cause of the Palestinian conflict with Israel is the Arabs’ desire to destroy Israel rather than the absence of a Palestinian state; and supports Israel’s right to defend itself against Palestinian terror. A whopping 94 percent of American Jews believe the Palestinians should be required to accept Israel’s right to exist as a precursor to any viable peace. Finally, a solid majority of American Jews supports either a US or an Israeli military strike against Iran’s nuclear installations. But no matter. Facts are no obstacle for J Street. Just as Sussman smears his opponents to discredit dissenting views, so J Street has not only misrepresented its own place on the American Jewish ideological spectrum. It has misrepresented the position of mainstream American Jewish groups on the ideological spectrum. Owing no doubt to the fact that most American Jews self-identify as liberals, J Street condemns organizations like AIPAC and the ADL as right-wing or conservative or hawkish to try to make American Jews feel uncomfortable supporting them. At its conference this week J Street’s radicalism was on full display. According to the JTA account, one panel discussion featured members of Congress debating the proposition that American Jewish money controls US foreign policy. Congressman Bob Filner (D-California) was reportedly the darling of the crowd for arguing that indeed, Jewish money exerts inordinate and destructive influence over US foreign policy. Filner related how in 1994 he was one of the few members of Congress who refused to sign onto a resolution condemning an anti-Semitic speech given by Nation of Islam lieutenant Khalid Abdul Muhammad. Filner claimed that by refusing to condemn a public figure’s calumny against the Jewish people he lost some $250,000 in electoral contributions in each subsequent election cycle. “That kind of money is an intimidating factor. I raised a lot less in succeeding years, but my conscious was cleared,” he bragged. This of course is pure nonsense. Kadima – like every other Zionist political party in Israel – supports strong sanctions on Iran. Indeed, Kadima supports taking whatever steps are necessary to prevent Iran from acquiring nuclear weapons. Beyond that, Kadima waged two wars while it was in office. Both Operation Cast Lead and the Second Lebanon War were opposed by the far-left. J Street was outspoken in its criticism of Cast Lead. Moreover, Kadima’s leaders have emphatically opposed the Goldstone Report. So other than its support for the rapid establishment of a Palestinian state, Kadima shares none of J Street’s positions. In recent weeks we have discovered that like its agent J Street, and indeed like Sussman at Brandeis, the Obama White House is also dedicated to silencing opposing voices by marginalizing and demonizing dissent. In fact, the White House’s modus operandi is startlingly similar to theirs. Obama as well as top administration officials boycott Fox programs and are seeking to intimidate friendly news organizations into joining them in isolating Fox. In a spate of recent statements on the subject, Obama’s top advisers have warned the other networks not to follow Fox’s lead on any of the stories it reports, lest they discover they have allowed themselves to become the tool of the Republicans. Luckily, the falseness of all of these claims has not been lost on the American public. Despite the actions of the likes of Sussman, “wildly pro-Zionist” voices still resonate on college campuses just as they do throughout the US. J Street has been unable to convince American Jews that its anti-Israel positions are the true expression of American Jewish Zionism. And Obama’s approval ratings now stand at a mere 51%. J Street supporters are neo-liberals and children of liberal Jews, who came of age, during the sixties and early seventies. That explains why J Street is uncomfortable with unabashedly supporting Israel because traditional Zionism is not politically correct. Left-wing faculty members, who are condescending toward mainstream America, dominate many college campuses. As a result, academic freedom is under assault, and so is freedom of speech. A return to intellectual honesty is sorely needed to restore balance in academia. And genuine Zionists need to support Z Street http://ziostreet.wordpress.com. Let me first start by completing the story of the history of the Goldstone report.What I would like to put on record is that the OIC was the initiator of this process. The OIC(Organization of Islamic Conference) is a unique organization — one that has no equivalent in the world. It unites the religious, economic, military, and political strength of 56 states. By contrast, the European Union represents half as many states and is a secular body only, and the Vatican — which speaks for the world’s 1.1 billion Catholics — is devoid of any political power. Established in 1969 to safeguard global Muslim interests, the 57-member Organisation of Islamic Conference (OIC) is the second largest inter-governmental body after the UN. The seat of the OIC is in Jeddah, but the organization regards that location as temporary: Its headquarters will be transferred to al-Kods (Islamized Jerusalem) when that city has been “liberated” from Israeli control. The OIC has massive funding from oil sources, which it lavishly spends on the Western media and academia and in countless “dialogues.” It influences Western policy, laws, and even textbooks through pressures brought by Muslim immigrants and by the Western nations’ own leftist parties. The red diaper boy Sussman , J street and Hussein Obama closely follow the agenda of OIS who initiated the Goldstone Report. We have a much greater conspiracy that can no longer be ignored, global Islamic dominance does not allow for any other voice,something that makes them and the left bed mates. The axis power of the the evil,godless left work hand in glove with their fellow Islamic devils who serve the same father of lies haSatan. They are soul brothers united in lineage to their first liar daddy even though they have another label to identify them. Many Muslims in the West resist the OIC’s tutelage and oppose its efforts to supplant Western law with sharia. But the OIC’s resources are formidable. I just recently moved to LA near UCLA. I went to one of the meetings that they have at Hillel called Bruins for Israel which is a group of students that work to create all kids of events that support Israel. At the meeting they where talking about making an event with a speaker that would talk about the last operation in Gaza. Some of the the students weren’t sure if they should put there logo on the event in fear that it would repel people from coming. It was very surprising .Also after telling a little from my own experience during Operation Cast Lead I felt like they really don’t know a lot about what is actually going on in Israel even though they are a group thats goal is support of Israel. They talked about big involvement of some of the members with AIPAC and even connections with there local congressmen. During the meeting they talked about what are the hot topics being discussed today concerning Israel. Some brought up the Goldstone report but others felt it was no longer an issue and is a thing of the past but none thought about Iran. I think they where more concerned about what others think about whats going on here instead of working on thinking about things that should be talked about more the Iranian or on how the Goldstone report will effect the future of democracy’s and really understand whats wrong about it. Its interesting to see what people my own age think about whats going on and how they see things when looking at it from so far away .I think they have a lot to learn if they really want to support Israel and hope that they won’t be prevented to show what they believe in just because it is pro Israel. Do you plan on making a trip to California any time soon Caroline? I think it would be great if someone like you would talk to the students about Israel and how to truly support her. What is most unfortunate for those wild-eyed, hysterical leftists who proudly proclaim their actions in the name of “Jewish” is that such enunciations matter not to the “non-Jewish” anti-semites, the would-be Hitler’s in their minds. Remember, once the Nazis got into power, utilizing the very democratic tools that Weimar Germany placed at their disposal and which they utterly despised, the first victims of their genocidal hatred were the leftists, socialists (never mind that their party officially used the word “socialist” in its title), communists, idealists, intelligentsia, so on and so forth. The “Jews” of J street, the liberal left, Hollywood, Naomi Klein’s and her spouse, Avi Lewis, host of Al Jazeera English show, to name a few self Jew-haters. They will find no place to hide once they help open the doors to power for Israel’s and Judaism’s true enemies. They, too, will burn in the next batch of ovens and will be thanked by our enemies for their help and stupidity. Dissent is being silenced across the board in America. The mass media (excepting Fox News) is almost a lapdog of the Obama administration. To find the the truth is increasing difficult these days and the bulk of it is to be found in the blogosphere. Along with the loons who occupy much of the blogosphere, fortunately their counterparts in the truth are powerful tools, IF utilized. This article specifically focuses on anti-Semitism run rampant in academe. Yes, we have an educational problem in our schools from K-12 and in the universities with the illiberal “teachers” who have “trained” the teachers in K-12. A vicious cycle/circle if there ever was one and one very hard to stop spinning. The ramifications for America and the world of this failed educational system are serious. This system is in large measure responsible for the anti-Semitism we see today on American campuses. Diversity run rampant leads to oppression. This is the theme. Speak out against the global warming hoax with all of the data backing up your claims? You risk your job. Speak out against these anti-Semites whose mantra is truth to power when it should be power to truth? Better put on the kevlar and be prepared to protect yourself. Our joke of an illiberal education system has left America with something that hardly resembles a joke. This stuff is dead serious. Caroline, the comments so far is a reflection of what we all share. Anti-Semitism is alive and well in the liberal academia world and its amazing those radical activist cannot debate the merits of their cause rather try to silence their opponents. I do find it disturbing a young Jewish lad Jonathan Sussman is so anti-Israel and anti-Zionist. I am beginning to understand what is meant by “Self-hating Jews”. A people led by G-d back to the land provided for them to live in peace. Why Israel and her people? In the wake of the cowardly Ft. Hoot mass fatal shooting of 11 or more unarmed U.S. soldiers by Maj. Malik Nadal Hasan, America has the right to know the truth about sleeper war cells in the U.S.
Walid Shoebat Former Islamic Terrorist who was once part of Jihad war cells in the US and understands fully the mindset of terrorists has been warning America of the potential of this very type of tragedy and worse for many years. Shoebat contends that the US Army, Navy, Air Force, FBI, CIA, Dept. of Homeland Security are all infiltrated with Muslim Extremists. — Muslims by Sharia Law are mandated never to fight Muslims. Muslim soldiers need to be questioned whether this is an issue, yet we virtually never question them. — Speaking at the Air Force Academy in Colorado to expose the infiltration of Islamist. Not only were over a hundred of Middle Eastern Muslims allowed to infiltrate, but were also allowed to threaten us with death with no repercussions whatsoever — Omar Khalifa, a student, got away with the threats and while Khalifa was related to Osama Bin Laden’s son-in-law, he was largely ignored! — At the Marines, our event was cancelled as to ‘not to offend Saudi visitors. At Camp Bullis was a Muslim in the U.S army who said he was ‘offended’ that I spoke on the issue of terrorism. Has ‘Political correctness’ seeped into our military apparatus to the point where no one can say anything lest they risk we offend someone? When Americans are being killed,all issues should be on the table. — The big question: Post Traumatic Stress Syndrome or Terrorism?Nidal never served in Iraq or Afghanistan to qualify as a candidate for Post Traumatic Stress Syndrome.